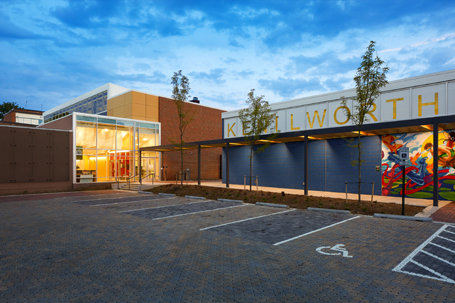 The Department of General Services partnered with the Department of Parks and Recreation to design and build a recreation center for the community at the former Kenilworth Elementary School site. 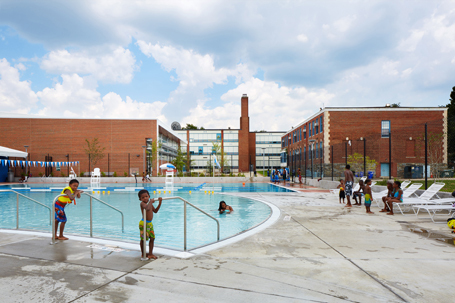 The project includes the addition of a competition-sized gymnasium, as well as an outdoor pool with a pool house and various site improvements. The existing building’s refurbishment includes approximately 18,000 sq ft. of renovated space, consisting of a new lobby/lounge area, a large multi-purpose space, fitness area, boxing area, locker rooms, men’s and women’s restrooms, senior and teen activity areas, a kitchen, and ADA accessibility upgrades. The outdoor pool is a 6,400 sq. 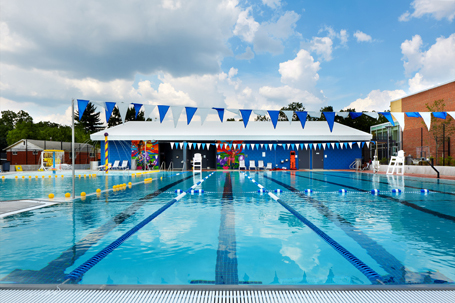 ft. multi-purpose pool which features a six lane 25-yard lap pool with recreation features such as water basketball goals, floatables, a zero depth pool entry with water spray features, and a sizable learn-to-swim and water exercise area. The pool house is configured with separate gender locker/change rooms on either side of a central entry area with a family change room, an office and first aid space. The east end of the pool house has a mechanical room and pool storage, accessed from the pool deck. By continuing Washington, DCs commitment to sustainability, the recreation center received LEED Gold Certification and Honorable Mention for USGBC Innovative Project of the Year award by the U.S. Green Building Council, Leadership in Energy and Environmental Design.